Anyone who’s ever planned a wedding knows that it’s very easy for the budget to get completely out of hand, and there are so many expenses that you may not have realized would be so, well, expensive. For example, did you know that the average cost to feed one wedding guest is $70? And the more guests you have, the more room you’ll need at your wedding venue…and the bigger the venue, the bigger the cost. Because of this, more and more couples are choosing to invite a less amount of wedding guests. Your initial instinct may be to invite every family member and friend you have, but when we’re talking $70 a head, it may be smart to do several wedding guest list drafts. Although it may be a tough process, it can save you thousands of dollars. But how do you exclude guests without offending friends and family members? This remains one of the trickiest aspects of wedding planning. According to the wedding planning professionals at Olympia Banquet Hall in Los Angeles, here’s how to cut your wedding guest list gracefully. Are They in Your Life? A good rule of thumb is: if you haven’t spoken to them in three years, they probably don’t need to be at your wedding. Unless they are just really important to you, ask yourself, “Do they even know I’m engaged? Have they met my fiancé? Are we still close?” If these answers are no, then you probably don’t need to invite them to your wedding. Pangs of guilt can be particularly sharp when it comes to those who were your best friends during your childhood and teenage years, but re-read the section above. “If they simply aren’t in your life anymore, consider how important it actually is for them to be at your wedding,” says Hambik at Olympia Banquet Hall. And don’t worry about them seeing your wedding photos if they follow you on Facebook or Instagram! It’s never a good idea to invite guests out of guilt. Yes, you spend a lot of time with your co-workers. And yes, you’ve probably chatted with them about your wedding plans over the past several months. But this doesn’t mean you should feel obligated to invite them to your wedding if you don’t want to. If you do want to, however, then that’s another story. Just invite the ones who are close to you and request that they don’t broadcast it too much at the workplace, to avoid hurting your other co-workers’ feelings. Never give in to pressure to invite co-workers (or especially your boss) to your big day. It’s your wedding. This is a very sensitive area, since most of the time parents pay for the wedding. This can give them some entitlement over who is invited, and you should probably allow them some wiggle room with the guests. But don’t let it get too out of control—especially if they want to invite guests that you really dislike. This is also a very sensitive area. Sure, you may not have seen your cousin in fifteen years, but if she’s the dramatic type, it could cause family issues if she doesn’t get a wedding invite. However, you can’t let this overtake your wedding guest list. Simply follow the same rule that you’ll follow for your friends and co-workers: invite those who you want to be there—those that you’re close with. Try not to feel too pressured, and remind yourself that it’s your wedding. Everyone agrees: plus ones are the bane of wedding guest lists. Sure, you want your close single friends or family members there—but not their annoying boyfriend or a date you’ve never met. And if you’re like most people, you may feel guilty asking those guests to come alone. But here’s the thing: don’t. By now, everyone should understand that every extra guest is expensive…and if you don’t know that extra guest or aren’t a big fan of them, it shouldn’t be a big deal. As adults, we’re all old enough to bite the bullet and attend weddings alone. If your friend or family member cares about you, they will understand. Make it clear to them that you want to see them on your big day, and you simply can’t afford to have extra strangers or someone you aren’t crazy about there. “By removing all guests aged 13 and under, you could end up trimming quite a lot from your wedding guest list,” suggests Hambik at Olympia. 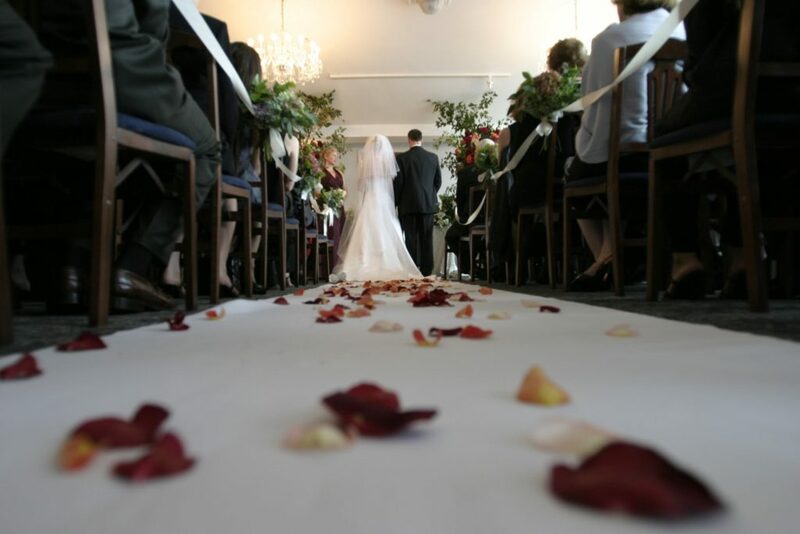 Many couples decide to have an adults-only wedding not only to save money, but also to ensure that no small children disrupt the ceremony that they’ve paid so much for. Although this isn’t always a popular decision, remember that it’s up to you! Once you’ve made your first guest list, make another one, and another, until you’re left with the number of guests that fit your budget. It won’t be easy, but you can do it. Make decisions that you’re comfortable with, and always keep in mind that it’s your wedding, and the guest list should reflect who you want to be there. If you follow these suggestions, you will end up with the right amount of wedding guests to fit your budget. And at $70 a person, that’s extremely helpful! Good luck with this tricky part of wedding planning, and happy planning!